Y’all know I love me some cash envelopes, right?! 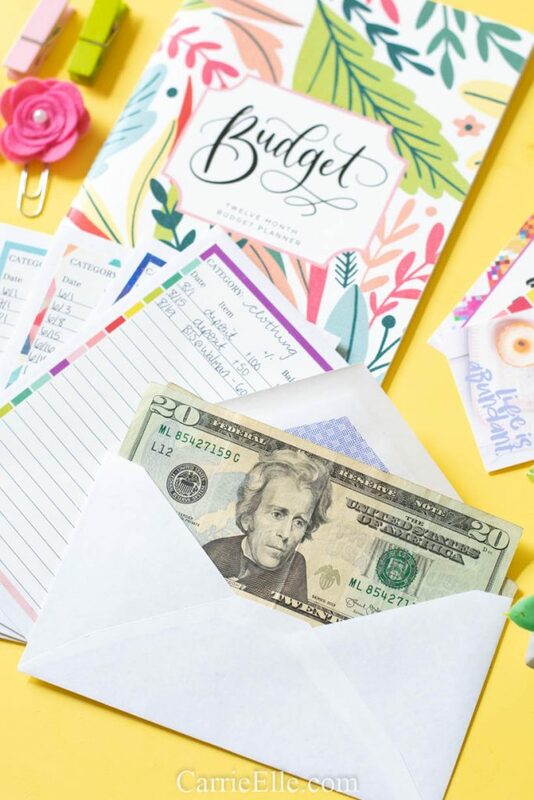 If you’re new to the blog, you can see how I use cash envelopes here – or join my free 60 Day Budgeting Challenge here. But I get one question over and over again when I talk budgeting, and that is, how do I use cash envelopes when making an online purchase or paying monthly bills? So let’s talk about it! I am going to share with you what works for us and how we integrate our cash envelopes into an increasingly cashless society – and I’m also going to share some really cool ideas I’ve learned from both my budgeting groups and teaching budgeting classes in person. How do I use cash envelopes when making an online purchase? I know it can be hard to use cash in what seems to be a debit and credit card-driven world. It’s just so easy to swipe. And sometimes I do just that, either because I made a snap impluse decision (booooo) or because I wanted to buy something online and was required to use a non-cash payment method. It’s ok when this happens! My budget is flexible (you’ll find more success with your budget if you think of your budget as something in a constant state of flow). If I made an impulse buy, I try to learn from my mistake. But if it was something I’ve planned out, I’ve found that it’s super easy to accomodate for this in a cash system. Because we fund our envelopes throughout the month (usually putting some money in them each week, as cash flow allows), this gives us some flexibility. In this case, I would write down the expense on my envelope (Amazon, $50). If I had already funded that envelope for the month, I would take out the $50 and move it to another envelope that needed to be funded (making sure to notate that somewhere so we withdraw $50 less next time we withdraw money from the bank). So basically, I’m just shuffling around the cash here. If I hadn’t funded that envelope yet, I would change our budgeting spreadsheet to show that instead of giving myself $100 that month, I have already spent $50 and therefore only need to withdraw $50 cash to fund the envelope that month. What are some other ways to buy things online when you’ve only got cash? So, that’s how I do it – but I’ve heard a couple of other really great ideas that I want to share with you, too. One is a similar take on the method I described above…just shuffling it to another envelope. But some people have a designated envelope for this exact circumstance. Let’s call it “Online Spending.” Any time you would make an online purchase (be it for groceries, Amazon, clothing, or any other category you’re saving for with cash), you would take the cash out of that envelope and put it in the “online spending” envelope. Then, like I described above, you could use that cash to fund the next round of envelopes, or depending on cash flow, deposit back into the bank to cover any expenses. This is why I really believe you need to be checking in with your budget regularly to keep on top of it! Here’s another option someone shared with me recently, and I think it’s genius for two reasons…first of all, you don’t have to do a bunch of money shuffling. And secondly, it puts one more step between you and your purchase, really giving you some time to think about it. Let’s say I have $100 and want to buy those $50 shoes on Amazon. Instead of buying it with a debit card, I could use my cash to purchase an Amazon gift card next time I’m at the grocery store…and then use that for the shoes. Now I’m really paying cash for those shoes AND I’ve had to think about them for a little longer, which means I probably really do want them and am not just acting on an impulse. How do you pay bills online with a cash envelope system? When we plan our budget, we have it sectioned off into online payments and cash payments. I like the flexibility of paying our rent (we sold off our house to pay off all our debt and are currently renting), insurance, and other regular bills online. This way we can set them up to pay automatically, which is helpful if, like us, you tend to forget due dates! We always have these withdrawn from the bank or use a debit card – never a credit card – for our bills. What is the best cash envelope system? I love cash. When I have cash, I’m a better a saver and a more responsible spender. I don’t like parting with my dollar bills, y’all! We use our Spend Well Budgeting System to keep our cash organized. You can also make your own cash envelope system using these free cash envelope printables. I know it can be tricky at first to wrangle in all the details of budgeting, especially if you’re new to it. Be kind to yourself, keep it flexible, and don’t give up. Also? Do what works for you. Don’t feel so tied to a system that it brings you down (that can totally happen, especially if you have perfectionist tendencies). I don’t mean to say let yourself be lazy or give yourself excuses…but if something really isn’t working, it’s okay to adapt to your own situation. After a few months, it will start to get easier – and after a few months, you’re going to see some real changes in your finances and you are going to love it.